Wolfgang Tire & Wheel Cleaner 128 oz. Home > Shop By Brand > Wolfgang Concours-Series Car Care > Wolfgang Tire & Wheel Cleaner 128 oz. Wolfgang Tire & Wheel Cleaner is a German-engineered wheel cleaner gel that clings to penetrate road grime on wheels and tires. The water-based formula is safe on all types of wheels, yet effective enough to penetrate and clean porous rubber. Wolfgang Tire & Wheel Cleaner is the only cleaner you need to clean and beautify your vehicle’s wheels and tires. 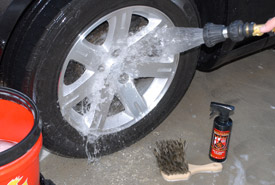 Wolfgang Tire & Wheel Cleaner was formulated for versatility, being equally gentle and effective on wheels and tires. Rest assured that Wolfgang Tire & Wheel Cleaner is safe to use on all kinds of wheels—including aluminum, painted, polished, anodized, clear coated and billet wheels. Emulsifiers in the cleaner capture dirt and dust on the wheel and allow them to be safely whisked away from even the most sensitive, expensive wheels without danger of scratching or spotting. Wolfgang Tire & Wheel Cleaner is safe on all types of wheels. 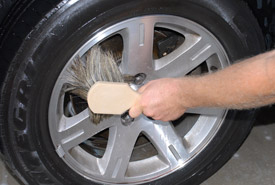 Use a soft Boar's Hair Wheel Brush on delicate wheel finishes. Rinse each wheel and tire before moving on to the next one. If possible, work out of direct sunlight. Wheels should be cool to the touch.Thoroughly wet wheel with water. 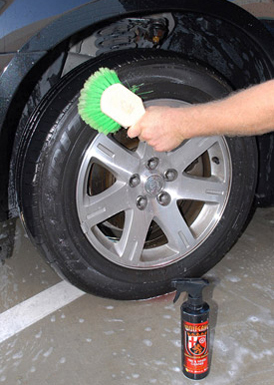 Excellent cleaner that puts a long lasting coating on the wheel and tire-- helps repel brake dust and dirt. I was really happy to find this. Love having a product that works on tires AND wheels and does a great job on BOTH. It's a little expensive, but if you detail enough eventually you realize that some things are worth the money, and this is one of them for me.